New Delhi : 2017 is all set to bring Nokia back in game, and hints have also getting leaked in the several online portals. An upcoming device from the company TA-1000 has been spotted on a China Compulsory Certification (3C) website. It is believed that the Nokia E1 is the same phone named as TA-1000 in the list. 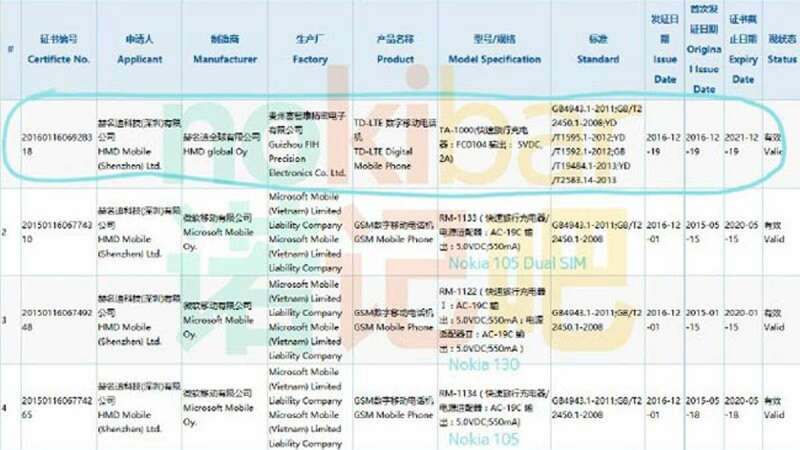 The 3C listing confirms that the Nokia TA-1000 comes with 5V/2A charging support, which means that the specific smartphone does not support fast charging - which is the reason for the Nokia E1, as that is tipped to be a mid-range device. Nokia is expected to launch at least five devices based on Android in 2017.